During the initial stage of the divorce process, one spouse typically initiates the proceedings by filing a divorce petition. 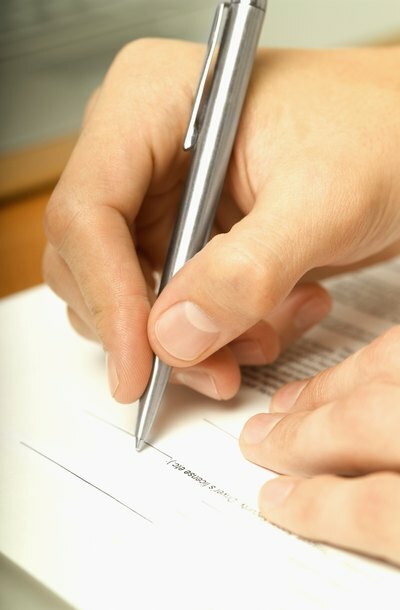 Generally, only the spouse filing the paperwork must sign the petition. After filing the divorce paperwork with the court, the filing spouse must serve the petition on her spouse. The spouse receiving the paperwork typically must respond with a written answer to the complaints made in the divorce petition. If he does not answer the petition, the court may enter a default judgment in the case. This means the judge may grant the divorce without hearing the other spouse’s requests or objections. When the petitioning party serves divorce papers on her husband, he is generally required to sign for them to show he received the documents. If he refuses to do so, the process server who delivers the papers may inform the spouse of the court date, leave the papers with him and create an affidavit attesting to the fact that he refused to sign for them. Likewise, some states allow spouses to provide notice of a divorce proceeding by publishing a notice in a newspaper when the other spouse cannot be located. After one spouse files for divorce and serves the divorce petition, the couple may reach an impasse if one party refuses to sign a settlement agreement. In such cases, the divorce will still proceed. Some judges may send the couple to mediation, so they can reach an agreement both parties feel comfortable signing. If the couple cannot reach an agreement during mediation, the divorce case proceeds to trial. In some jurisdictions, the court might also schedule a trial without first considering mediation when one spouse refuses to sign the settlement agreement. Following a divorce trial, the court will decide on an equitable settlement that will not require the spouses' signatures. Likewise, after the court enters a final judgment of divorce, generally, neither spouse must sign any paperwork. At this final stage in the divorce process, only the judge’s signature is necessary for the divorce and any settlement agreements to hold legal effect. Legal Action Workshop: What if my Spouse Won’t Cooperate in a California Divorce? Stephens Margolin, P.C. : Divorce Myth: Your Spouse Can Block a Divorce by Objecting to It.